What is a rate-tracker home loan, and is it right for you? If you’ve been following the banking inquiry news, you might have heard the term rate-tracker loan thrown around. The introduction of more rate-tracker loan products was suggested as one reform that could help Aussies and their banks get along a little better. But what exactly are we talking about when we say a home loan is a ‘rate-tracker’? And more importantly, is it actually a good deal? We’ve collected all the need-to-know facts about rate-tracker loans so you can make an informed decision. What is a rate-tracker loan? A rate tracker loan is just what it sounds like — it’s a variable rate home loan, but it’s interest rate is pinned to the official RBA cash rate. That means that when the RBA increase or decreases rates, the interest rate on a rate-tracker loan will increase or decrease by the same amount. It doesn’t mean that you’ll be getting a home loan at the same interest rate as the RBA cash rate. The rate-tracker interest rate will stay at a constant level above the cash rate — often 2-3% above. What’s the difference between that and a variable rate loan? If you’re thinking that that sounds an awful lot like any other variable rate home loan, you’re right. But there’s a key difference: although interest rates on variable rate products are theoretically dependent on the RBA cash rate, there’s no guarantee banks will make changes in line with the RBA. They aren't actually required to follow RBA changes, which is why, when rates change, you might not actually see a difference in your home loan repayments. If you had a rate tracker home loan, then your interest rate is guaranteed to change the same amount as the RBA rate did, and at the same time. Have there been rate-tracker loans before? There’s nothing new under the sun and this is no different. The idea of a rate-tracking loan has been around for some time, but while it’s still pretty popular in the UK, it never really took off in Australia. QT Mutual Bank gave it a go with their Rate Tracker home loan, which was pegged at 290 bp above the official cash rate. That means that if the RBA rate was 1%, it would have an interest rate of 3.90%. This loan was available from November 2010 to May 2015. The only other example we came across was Loans.com.au’s Dream Loan Express Rate Tracking loan, which was linked to the RBA cash rate for the first three years of the loan. It was pretty short lived, and only lasted from June 2011 to October 2012. Are there any rate-tracker loans available now? If you’re keen to get on the Rate-tracker mortgage trend, then there isn’t much to choose from just yet. Banks have been slow to jump on rate-tracking loans, because they’ve always had problems with offering a Rate-tracker loan that’s a competitive deal before, which is one of the downsides, discussed below. But there is one option: Auswide Bank recently introduced an RBA Rate Tracker Loan. It’s available to owner occupiers for amounts starting at $150,000, and at the time of writing, comes with a 3.99% interest rate. That’s not a bad deal, but at the moment, there are plenty of offers with interest rates below 4% — so you might want to shop around before settling. Update: ANZ CEO Shayne Elliott recently said that the Big bank was considering its own rate-tracker product, but that it would likely come at a premium, due to the higher risk involved for the bank. Never miss out on a rate cut. If the RBA cuts rates, you’ll get the same cut on your home loan. That means you’ll save on repayments — and if rates stay low for a long time, as they have been recently, you’ll keep your low interest rate and repayments. Quick rate reductions. Some banks take weeks to pass on RBA rate cuts, if they pass them on at all. Rate-tracker loans generally change rates much quicker — Auswide Bank promises to pass on any changes within 2 days — so you’ll see the benefits of a rate cut as soon as possible. Stability. No more guessing whether or not your lender will pass on an RBA change. You’ll know how much your interest rate is going to change and when, since it will change at the same time as the RBA cash rate. Knowing that will make it even easier to plan for rate changes in your budget. 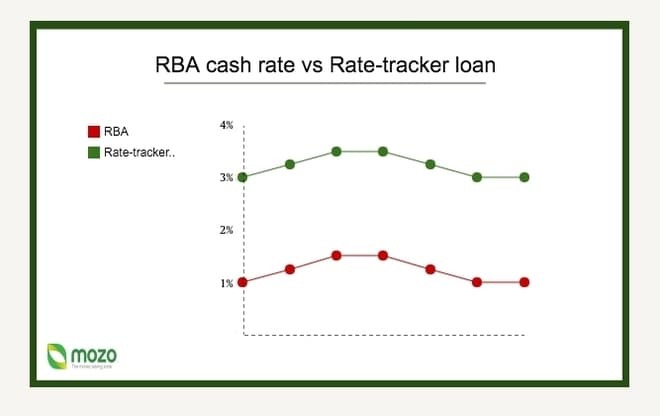 On the other hand, there’s a reason why rate-tracker loans aren’t all that popular among Aussies. No avoiding a rate increase. With a rate-tracker home loan, you know you’re going to get hit with any rate increases the RBA makes. Although, considering most home loan lenders are pretty quick to pass on rate rises, this isn’t a major disadvantage. Higher rates. You might snag a rate-tracker loan that’s a really good deal, BUT, for the most part, the added risk on the bank’s part, means that the interest rate you’re offered isn’t great. You can wind up paying way more on a rate-tracker loan than on an ordinary low rate variable mortgage. The CUA Rate Breaker*, is a variable rate home loan that tracks the average Big 4 Bank rate and offers a 1% discount off it (0.70% for investors). It’s a good alternative to a Big 4 loan, since you’re guaranteed to get a more competitive deal than they’re offering, but remember that it doesn’t necessarily mean you’ll be getting the best rate on the market. If you’re after a home loan that will save you money in the long run, the best strategy is to do your own research, compare the mortgage offers on the market and find a product that suits you.